The OEM vehicle inertia switch is retained as a means to disable fuel pump operation in the event of a collision. Additional safety features contained within the tank assembly itself include an 80 percent fill sensor and stop fill solenoid to eliminate the potential for over filling the tank. A pressure relief valve will vent the tank in the event that tank pressure exceeds 312 psig. 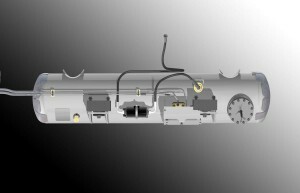 An excess flow valve is located within the supply line and is used to detect when an inordinate amount of fuel is being supplied to the system and will immediately stop the flow of fuel. In the event that a line ruptures, these valves prevent the dispersing of fuel directly into the atmosphere.